Dunbar and Boardman: What Makes the Lynton and Lynmouth Cliff Railway Different? The Lynton and Lynmouth Railway is a funicular or cliff railway that connects the twin villages of Lynton and Lynmouth in Devon. Predominantly located in seaside towns there are quite a few working examples of funiculars dotted around the coastline of the British Isles. For a comprehensive list of funiculars in Britain click ‘here’. In the 19th century the hill separating Lynmouth at the bottom of the hill and Lynton at the top created difficult transport conditions. It was relatively easy for food and other essentials to arrive at Lynmouth via sailing vessel but then the goods needed to be transferred via pack horse up the steep hill to Lynton. From the 1820s holidaymakers who visited Lynmouth from Bristol, Swansea and other channel ports were often deterred from visiting Lynton because of the hill. The economic prosperity of Lynton was being limited because of it. In 1881 the idea of a tramway between the two villages was first discussed publicly. Three men were largely responsible for bringing this idea to life and they were Thomas Hewitt, John Heyward and George Newnes. Through their endeavour a dedicated act of parliament, the ‘Lynmouth Promenade, Pier and Lift Provisional Order became an Act of Parliament in 1888. Construction of the railway occurred between 1887 and 1890 and on Easter Monday in 1890 the Cliff Railway was opened. How Does the Railway Work? Similar to other funiculars the Cliff Railway at Lynton and Lynmouth consists of a pair of tram like cars attached to each other by a cable. The ascending and descending vehicles counterbalance each other. 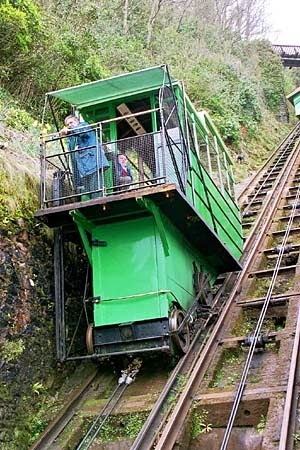 The Lynton and Lynmouth Railway is one of only a handful of water-powered funiculars currently in existence. Both cars contain full water tanks (700 gallons) and to generate movement the driver of the bottom car discharges water from its tanks and that makes the top car heavier. The cars then begin to move then and gravity takes over. Each car has two sets of brakes that are water operated. The ‘governor’, which in turn, is driven by the main wheels, operates one set. The other set of brakes are calliper type and are permanently on - operated by a large water accumulator via the driver’s hand wheel. When the cars are unattended, the brakes clamp it to the rails making movement impossible. No water is pumped from the top to the bottom, instead it is taken from a nearby river and the Act of Parliament mentioned above granted The Lynmouth and Lynton Lift Company the perpetual right to extract up to 60,000 gallons of water a day. How popular were Water Powered Funiculars? In the late 19th century there were a lot of water-powered funiculars constructed around the world but most of them were later converted into engine driven versions. There are a few still remaining at: Elevador do Bom Jesus in Portugal, Nerobergbahn in Wiesbaden, Germany, Funiculaire Neuveville-St.Pierre in Fribourg, Switzerland and of course at Lynton and Lynmouth. What makes the Lynton and Lynmouth funicular different? The funicular needs absolutely no power to operate (however power is required for the lighting). The funicular works on a total loss system. Water provides the power and is not pumped from the bottom to the top. Used water is dropped onto Lynmouth beach 100 metres away from the river from where it was taken. The lifts do not create any emissions and have a low carbon footprint for this reason the railway is recognised as one of Britain’s most environmentally friendly tourist attractions. Funiculars are a very specific type of vertical transportation. Dunbar and Boardman is the lift, escalator and access equipment consultancy. Are you currently planning a project that will involve vertical transportation? We would be happy to discuss with you. Give us a call on T +44 (0)20 7739 5093 or send us an email via peterboardman@dunbarboardman.com to start the conversation. How Does the Schmid Peoplemover Work?